Dapat e-mail dari teman untuk dikongsi bersama. Beware and be cautious when performing jobs. Accidents can occur anywhere, even at the office. 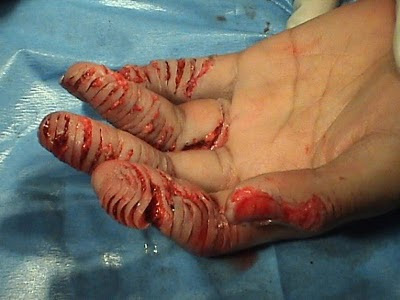 Sharing with you all a picture of a hand that was accidentally caught inside a 'Paper Shredder'. The person was trying to take paper jammed out from the shredder but didn't realize that her fingers was caught and pulled inside. Remember always switch off the power and remove the power connection plug, when trying to remove any jammed paper.
" THE SAFE WAY IS THE ONLY WAY "